My Thanksgiving Table and Elastic Waist Pants! I’ll be donning my elastic waist pants, whipping up a big Tom turkey and carbo loading up a storm this Thanksgiving. 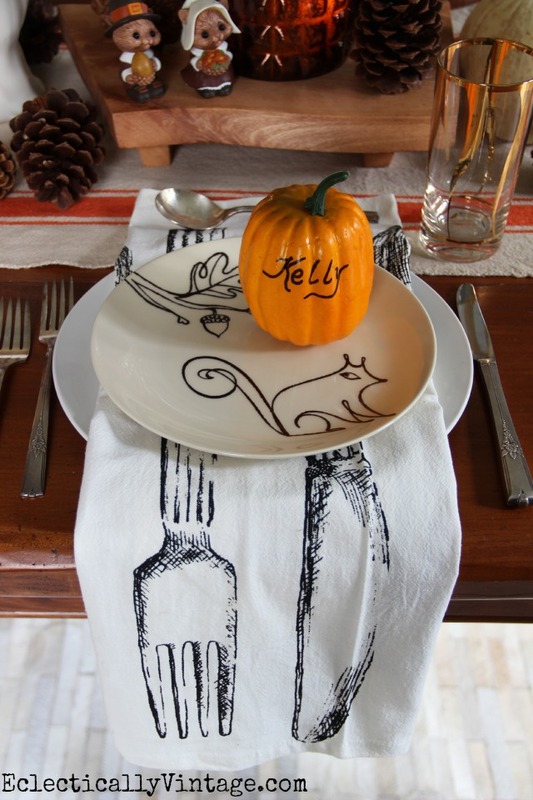 Second best part – (besides all those carbs) an excuse to set the table in a fun way. Make sure to check out my house all decked out for fall. 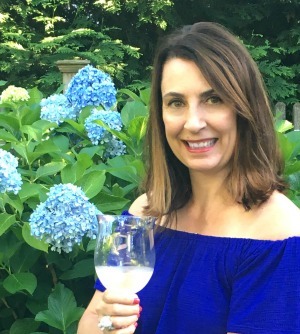 Twenty five fabulous friends are sharing their Thanksgiving tables this week (five a day) thanks to Lindsay at The White Buffalo Styling Co. and you can hop from one blog to the next to see them all. 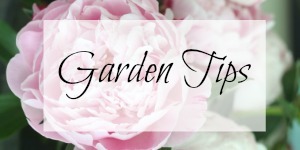 Make sure to check out the stop before me – Run to Radiance – to see what she whipped up. Here’s how I’m setting the table this year. Orange stripes on the table runner was just the pop of color this table needed and a couple of raised wooden slabs add just a little height so everyone can still see each other across the table! 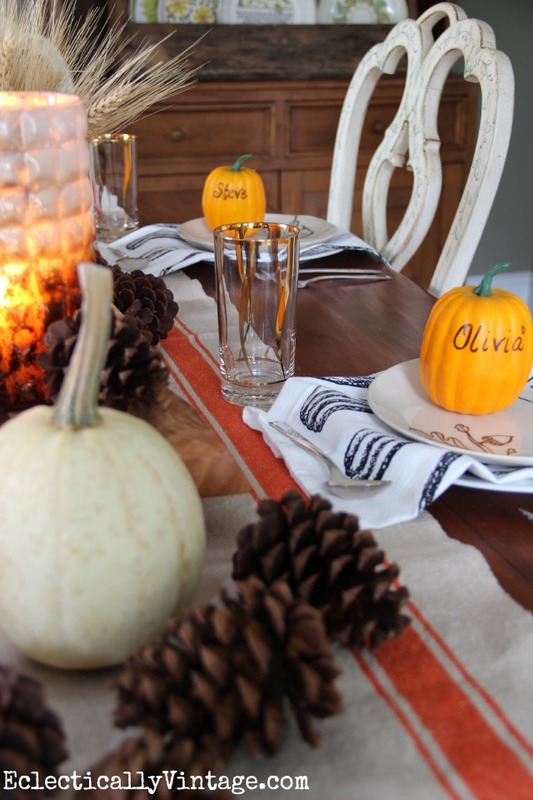 More orange on these little pumpkin place settings will soon turn into Thankful Pumpkins. I mean enjoying a leisurely meal by candlelight. One of my first jobs was working in a Hallmark store where I squirreled away these salt and pepper shakers for many years until I could finally set them out on my own Thanksgiving table. Gold glasses, silverware and my cow pitcher add vintage charm. Here’s to food, family and elastic waistbands. P.S. 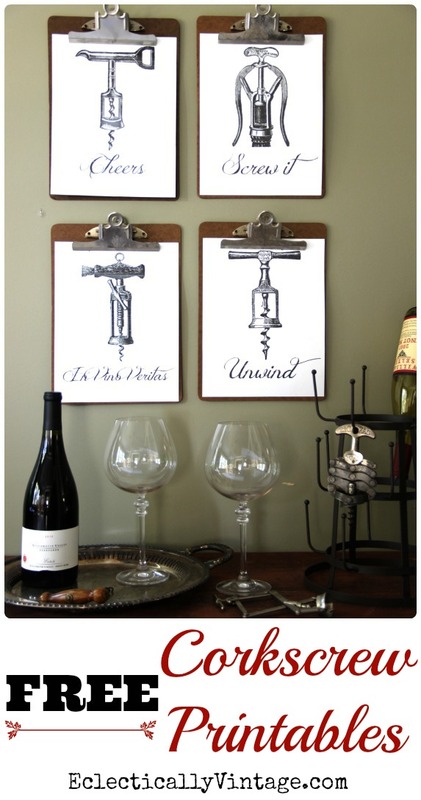 Don’t forget to print out my FREE vintage corkscrew printables – they make the perfect hostess gift! 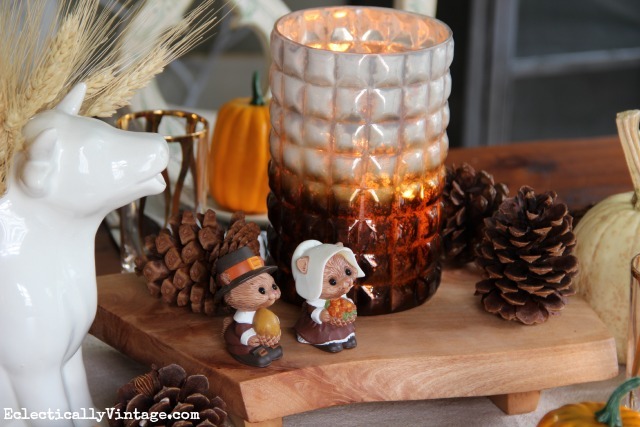 Hop over to Simple Stylings next to see how she does Thanksgiving. squirrel salt & pepper shakers – Hallmark 20 years ago! so fun and so you! i love the squirrel plates! and love the touch of orange in the runner! 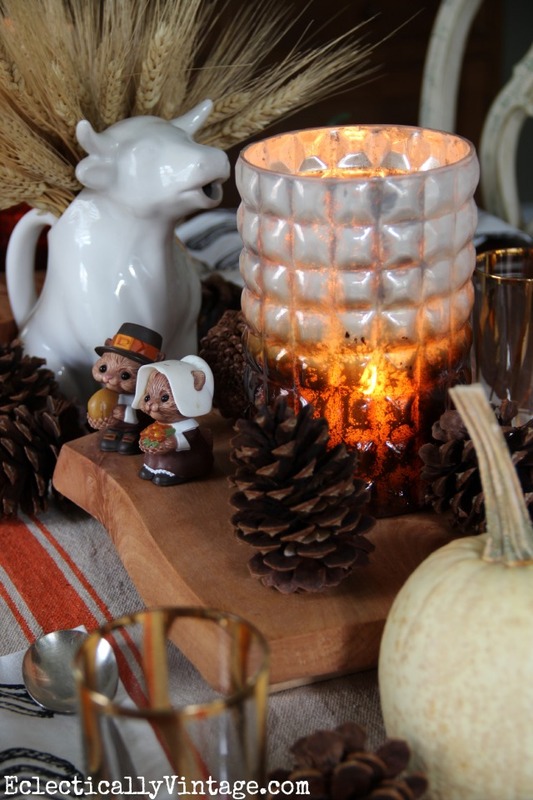 I love all the fun elements in your table scape. Those plates are my favorite! I love all the details. 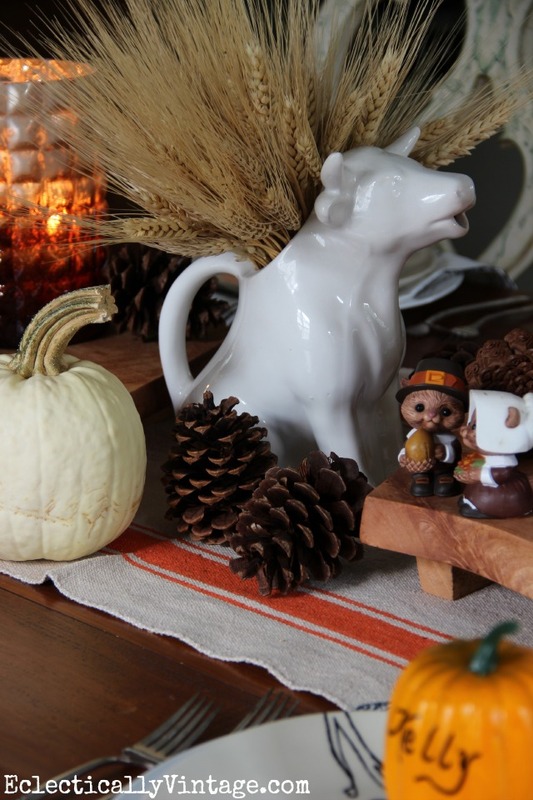 That cow pitcher as a vase is perfect! How fun and so pretty. 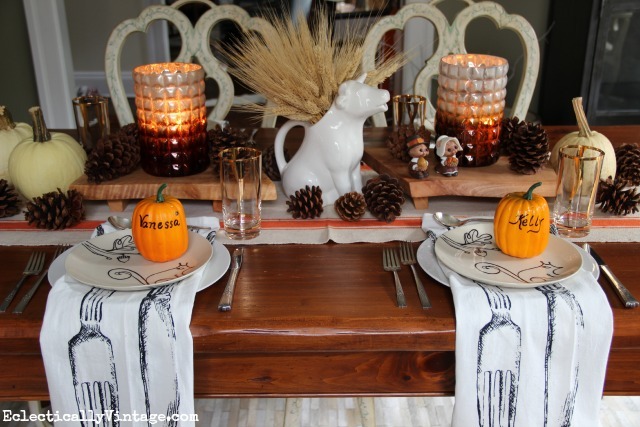 Love the wheat and the cow pitcher, Gorgeous Tablescape. Laura – we started a fun tradition last year making Thankful Pumpkins. 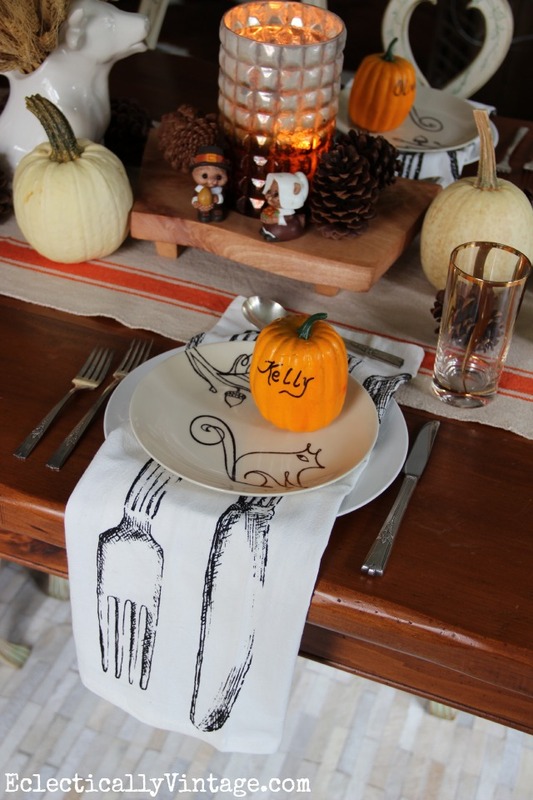 So we will use those pumpkin place settings and write everything we are thankful for this year. I have ours from last year – it will be fun to look back on them for years to come. I read that people consume 4,500 calories at a Thanksgiving dinner. That’d explain why we need the elastic waist pants, LOL. I love your place settings! What’s the source for the printed napkins? So whimsical! 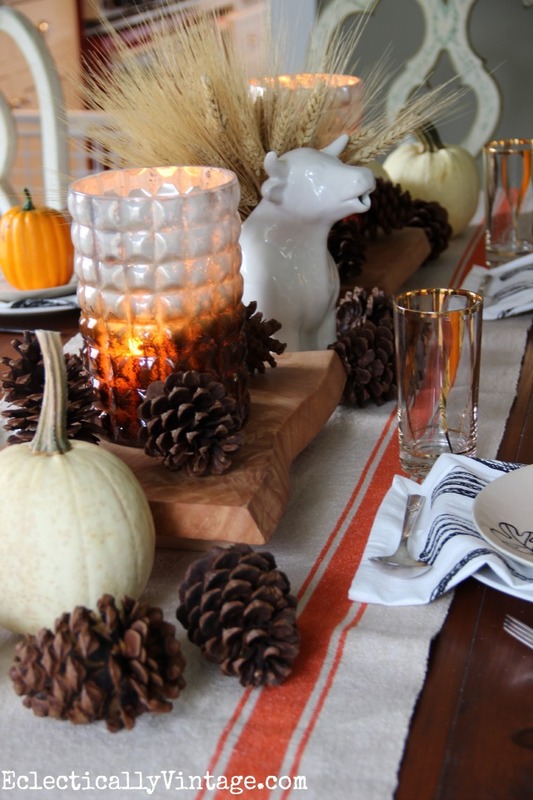 Oh I love this table….you can always incorporate fun with beauty!.. Wonderfully decorated,it is so you,i think. Love all your decorations.Have a great day. I love this especially those plates and napkins! The pumpkins are adorable!! 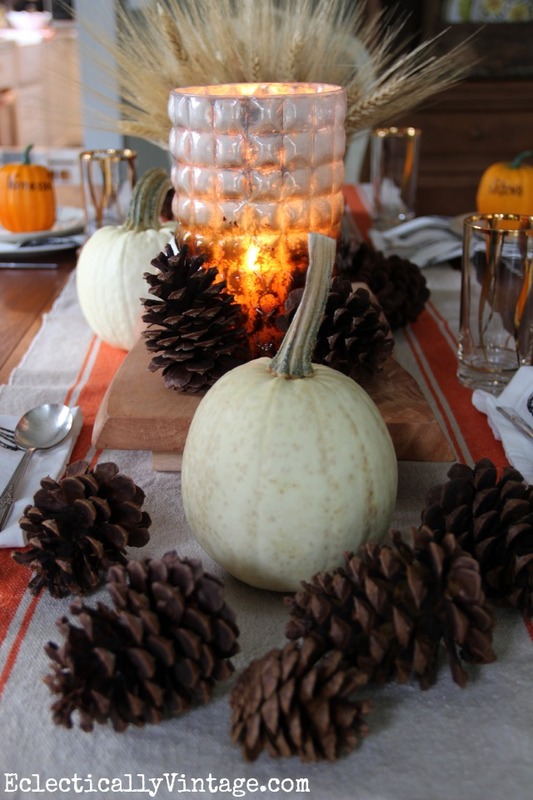 Oh my goodness….I’m a not so secret lover of pinecones and I think you’re table runner is calling my name. Love! I am with ya on those elastic waistbands, sister! Thanks so much Mary and wishing you a very happy Thanksgiving – pass the mashed potatoes!